Radio waves, catastrophe survivalism, rave culture, extended mind theory, UFOs, time travel, hyperdimensional geometry, ritual, ecstasy, divine communication, Norse myths, ancient monuments, religion as technology, and technology as religion. I have struggled to put into words the full spectrum covered by the Noöspherics conference and club night, hosted and orchestrated by the Canadian-born artist Erin Sexton at Lydgalleriet in Bergen, April 23-24, 2018. On this rainy spring weekend, one of the most eclectic line-ups I have ever seen came together for two days of art and speculation, a two-stage rocket arranged as a follow up to Erin's 2017 exhibit NOÖSPHERE in the same space. With these two events, Erin had pieced together a project exploring communication, crisis, and implicitly humanity's place in the universe, heavily based in the medium of supposedly "reduntant" radio technology, warning of the perils of putting too much trust in the promises of ever more complex, high-maintenance technologies. She set up a rudimentary radio transmitter by Svartediket in Bergen, and established communications with a local radio tower, where the brainwaves of two artists were scanned and broadcast over the city of Bergen. The signal bounced off the ionosphere and darted into space at the speed of light. Somewhere in outer space their brainwaves are travelling still, and will be for lightyears to come. The noösphere is a term meaning "sphere of mind". Interestingly, this term was born by the joint intelligence of Pierre Chardin, Edouard Le Roy, and Vladimir Vernadsky in the early 20th century, in an attempt to describe how the conscious human mind engages in reciprocal information exchange with the world around it. Just like humanity is not merely a collection of individuals, but a sprawling blob, that through its cognition imparts massive footprints upon the physical world, the noösphere is not so much a collection of minds as it is the sum of mind itself. A consciousness index. Owing to the over-obvious fact that humans are organisms, noösphere seems presupposed by biosphere - the sphere of organic life. In turn, the biosphere owes much of its existence to the geosphere - the sphere of inanimate matter. It is only natural that there should be a term covering the sphere of conscious information exchange. Turned on its head, however, there is no apparent reason why an organism should develop sentience as it is normally understood, and when we look to the stars it is quite apparent that even organisms do not logically follow in the footsteps of geology. So far, the only example is us. This invites us to question the absolute relationship between life and inanimate matter, and if consciousness can't be detached from our physical bodies. If not by some spiritual technique, as our ancestors believed (and really, many still do), then perhaps through some technological solution. So what does any of this have to do with Norse culture? As we have previously covered here on Brute Norse, the Norse were just some of many archaic societies operating under the general suspicion that the mind is, at the very least, semi-detatchable from the body. Norse culture assumed that unseen things existed all around us, and it operated with a cosmological model that allowed its gods and heroes to dive through portals to the otherworld, sometimes open, sometimes closed, as if space-time itself was being folded. If there is even as much as a symbolic truth to this, as one might argue, the future technologies may encourage humans to catch up with the metaphors of their ancestors. I was asked to write the opening essay for the gem that is the Noöspherics conference book (Topos Bokforlag 2018), called "The Antenna on the Holy Mountain: Noöspheric meditations on the Norse Cargo cult". This was no easy task, but I used the opportunity to explore the oftentimes wistful inadequacies of scholarship, when faced with penetrating the mind and experiences of humans long since dead. Other subjects included the wastefully short attention span of contemporary society, and the chronopobia it exhibits when comparing its own achievements to those of our technologically "primitive" ancestors, without whom none of this would have been possible. The conference began with a brief presentation by Erin, our aforementioned hostess, before she passed the microphone to a delegation from Bergen Kringkaster. They are an association of radio amateurs volunteering to maintain a local radio transmitter, who besides explaining their history and efforts, broadcast the entire conference live on FM radio. Next up was the musicologist and neuroscientist Dr. Maria Witek with an interesting presentation about extended mind theory in the context of rave culture, which seemed to spark quite an interest with the audience, leading to discussions on everything from musical subcultures, to the "hive mind" observed in in colonies of certain insects. This in turn was followed by the Japanese independent brainwave researcher Masahiro Kahata, who shared the history of his work, and the development of his own open-source brainwave interface, while also touching upon his research on hyperdimensional intelligences and UFOs. This was certainly one of the more extraordinary contributions to an already extraordinary conference. 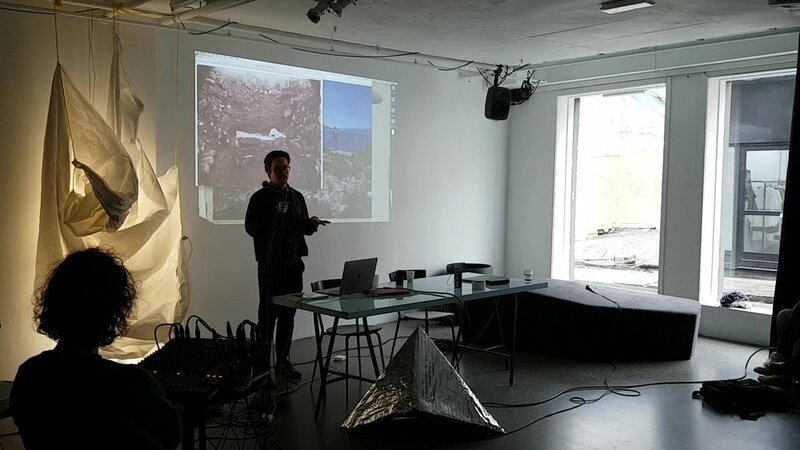 Finally, I had the pleasure of giving the closing presentation, which was a brief lament on ironies and frustrations that fuel my work, using radio as a metaphor in the context of pre-Christian sacred sites, finding my main example in the 3000 year old bronze age mound at Tjernagel in West Norway, destroyed in 1983 to facilitate a short wave transmitter, which in turn was torn down two decades later. Looking back, I can hardly think of a time where the term "interdisciplinary" was more appropriately applied. I was rather winded by the time I stepped up to talk, something I can partially attribute to the party of the evening before, where I performed poetic recital based on the rúnatals þáttr section of the Hávamál, wearing a noose necktie, and performing rites, strapped up with electrodes that scanned my brain like some scandifuturist hypostasis of Hangatýr himself. Mr. Kahata was the star of the show, as the attached exhibit represented his artistic debut, displaying alongside Erin Sexton various installations on the theme of communication and hyperdimensionality. Remarkably a prismatic laser sculpture in the form of a double pentagram, which was apparently a symbol for planet Earth in some xenoculture, revealed to one of his test subjects in dialogue with a hyperdimensional being. The dancefloor was issued contraptions of his own making, electrode headgear was handed out to clubbers, who eagerly passed them around to see their brainwaves visualized and projected on the walls, strobes flashing like a David Cronenberg movie. Because this was an open event in a venue known to switch seamlessly between art space and techno club, most of the audience had no idea what they were walking in to, and seemed genuinely perplexed. I hope it stuck with them. It certainly did to me. A video of my presentation is available to my patrons. If you enjoyed this article, please consider supporting Brute Norse on Patreon.